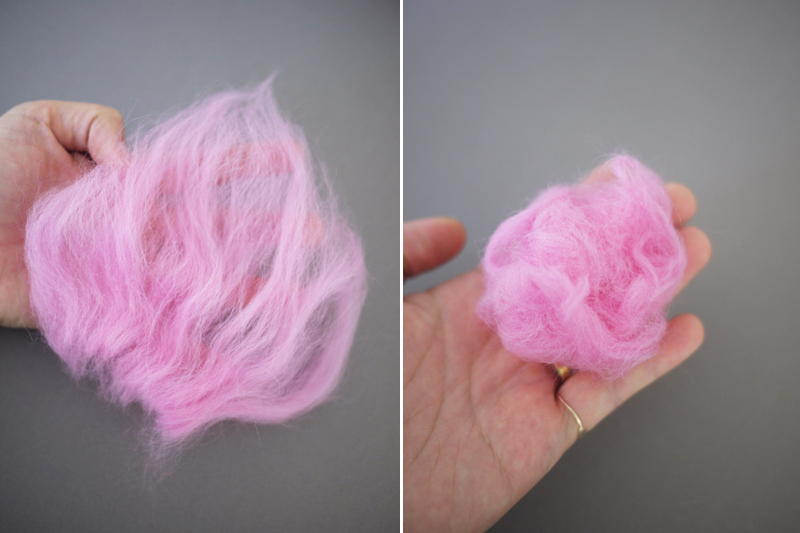 Ever since I experimented with needle felting earlier this year, I’ve been fascinated with the plethora of potential DIYs associated with this age-old technique. 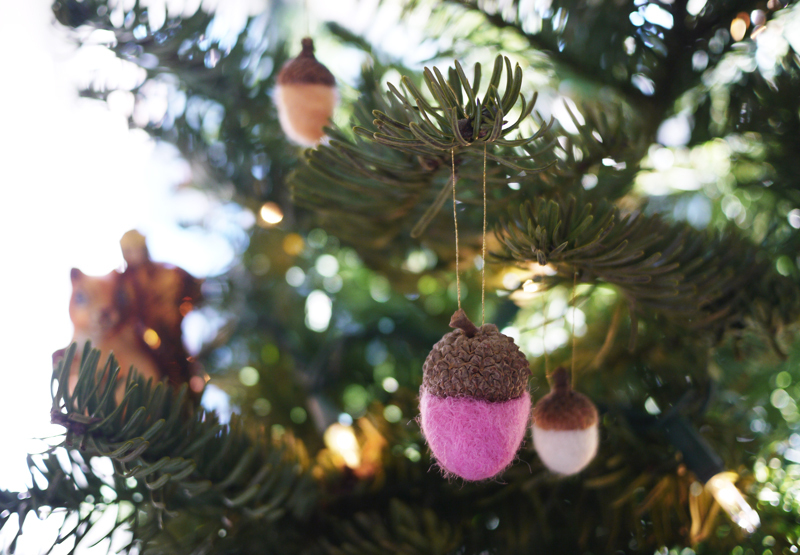 After spotting felted acorns at an adorable boutique in Carmel, I quickly discovered I couldn’t achieve the look with a felting needle (Honestly, fail!) 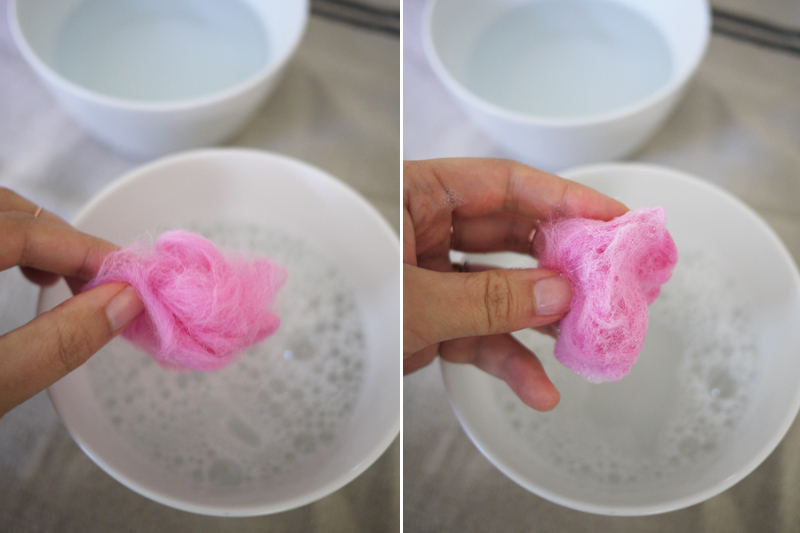 Instead it required an easier method called wet felting which simply involves some hot, soapy water. 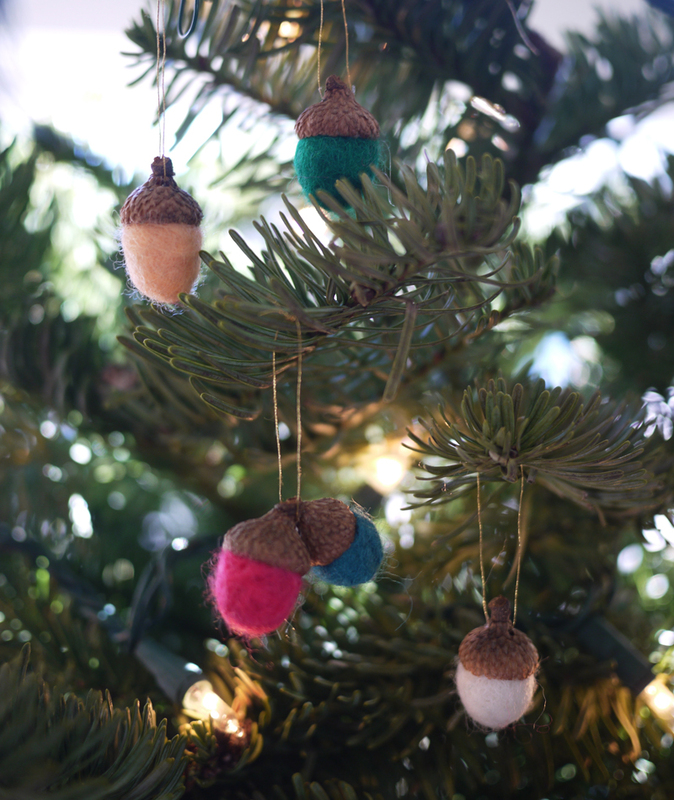 Suffice to say, I’m obsessed and can’t wait to make a bevy of these felted knickknacks! Start by working with a half handful of wool roving at a time. Separate the fibers and roll them back together into a loose ball. Fill two bowls with hot water. Put 2 drops of dishwashing fluid into one of the bowls to create hot, soapy water. 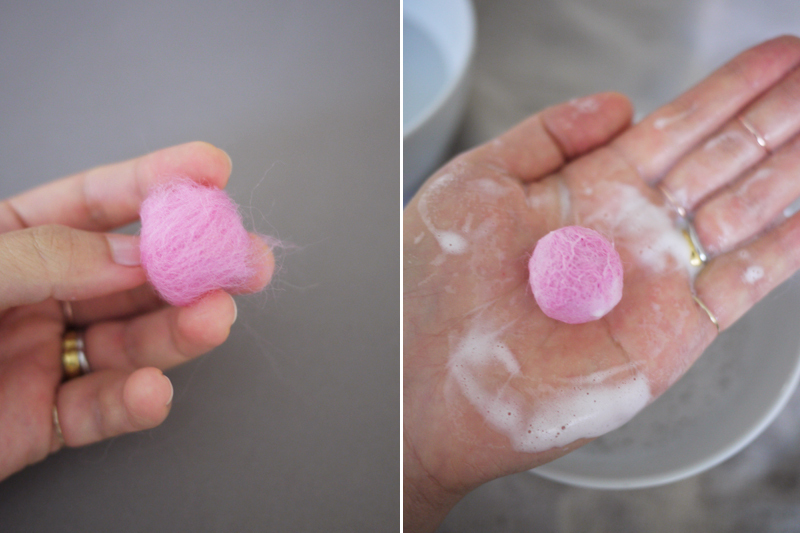 Dunk the ball of roving into the soapy water. Gently roll it between the palms in a circular motion, as if rolling cookie dough or meatballs. This takes patience as at first as it won’t seem like the ball is taking shape. 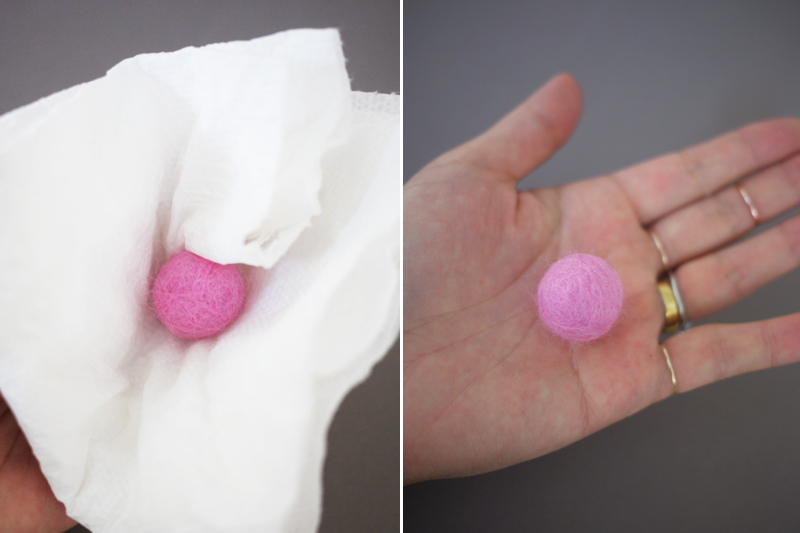 Keep rolling and if the ball is too soapy, dunk it into the clean hot water and continue rolling gently. Keep repeating the dunk and roll steps. As the fibers become agitated with the hot, soapy water it will become denser and denser. Soon enough, the ball will form nicely. If there are some cracks in the ball, pull off a tiny section of roving, spread it apart, and lay it over the cracked section. 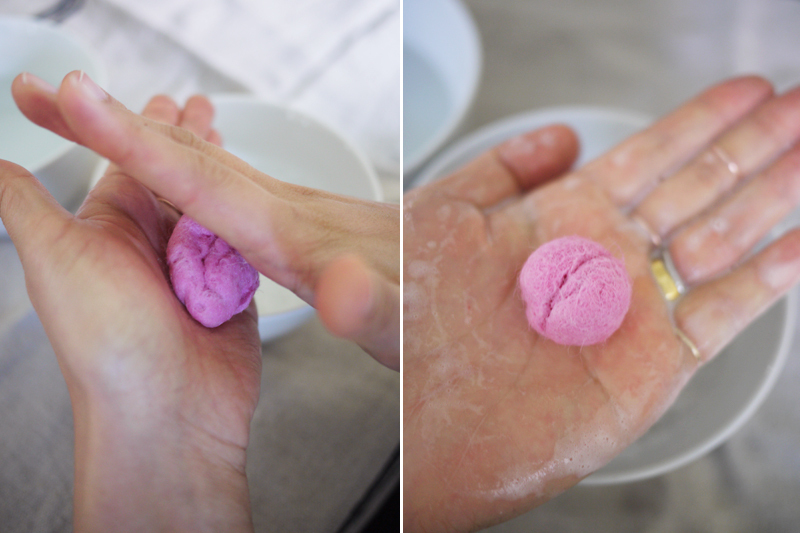 Wrap any excess roving around the ball, dunk it in the soapy water and continue rolling. If the ball doesn’t seem to be taking to the additional roving – keep rolling. Tip: when in doubt, keep rolling! Rince the soapy ball into the clean water bowl. Squeeze any excess water out with a paper towel and reshape it with clean, dry hands. Set the ball aside and allow to dry for 12 hours. 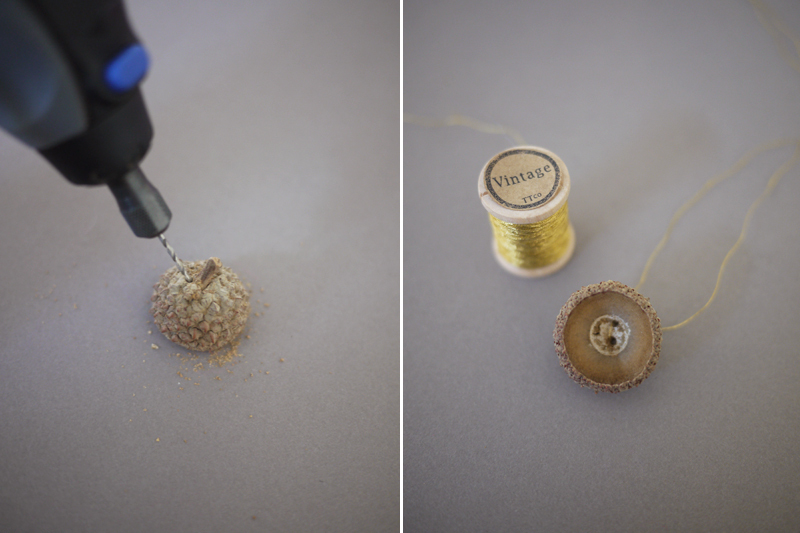 In the meantime, drill two small holes at the top of the acorn cap. Pull a 6 inch piece of thread through the cap. 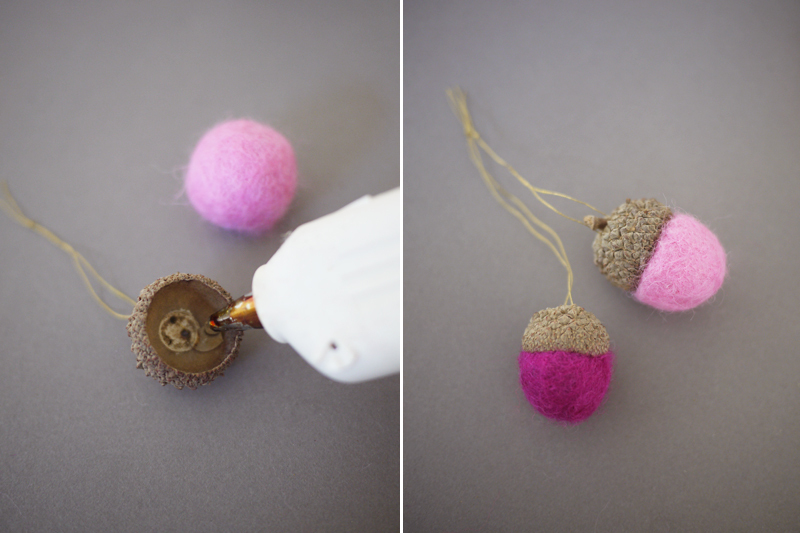 When the felt ball is dry, squeeze hot glue into the inside of the cap. 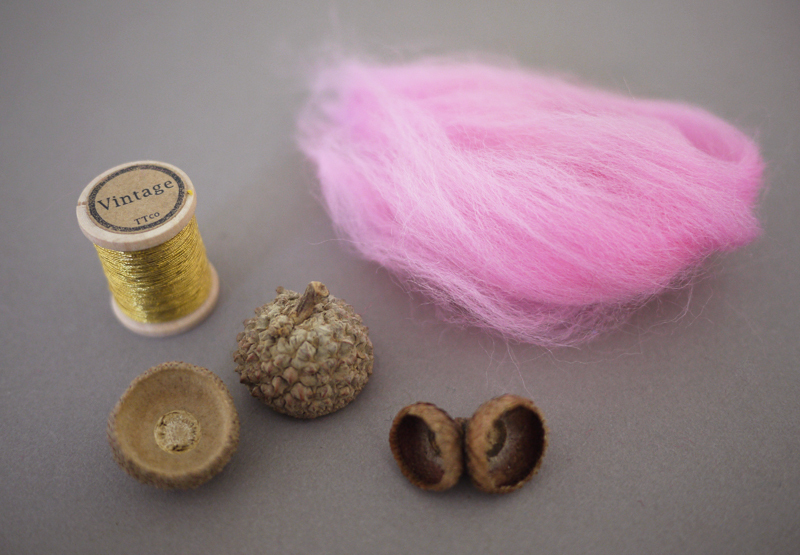 Fit the felt ball into acorn cap. For a more oval shaped acorn, simply roll the ball between the palms in one direction to elongate the shape. 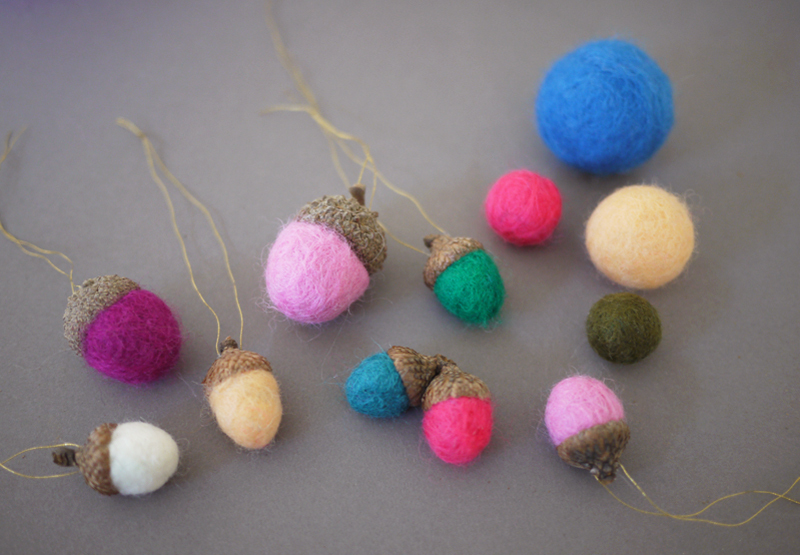 Your colorful felt balls are finished!! 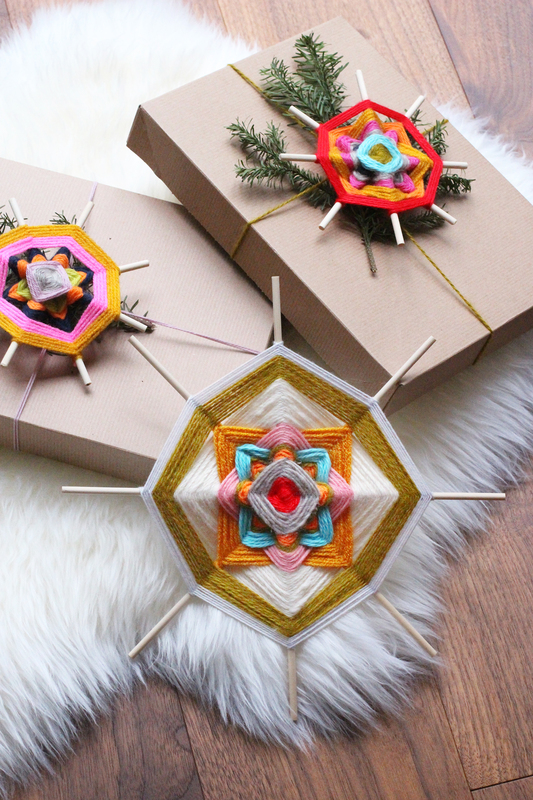 Hang them on your tree, add them as toppers to wrapped gifts, or place them all into a pretty bowl as decor. Great DIY:) It’s a nice idea to decorate our christmas tree. Love this! 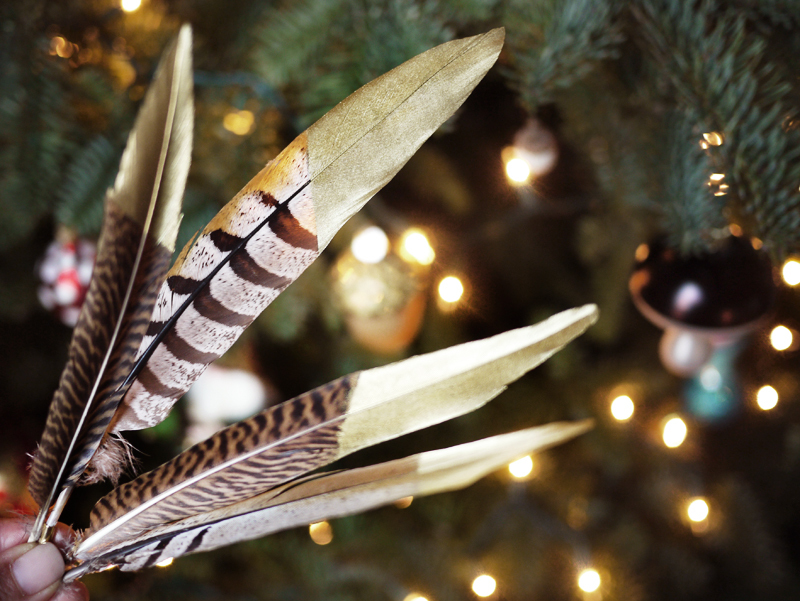 Been making DIY ornaments and my own alternative Xmas tree all week so I will def have to try this one out! Enter my GIVEAWAY for a class at The Sewing Studio!! I really love this diy!!! it’s easy to do and so cute!!! Best christmas DIY I have ever seen!! Taht si so nice idea. Have a nice day. So cute! I love all the different colors and these are great even after the holiday season is over! so cute! i love DIY’s that are easy and look lovely too! These are super adorable. I would have never thought of this. We really love the outcome! Great post! Those are so adorable! This is a great DIY project! This is incredibly creative! I love it!! I loved them! They look cute and cozy! Excelent for a christmas tree!! So cute and timeless, love this! Simply adorable! Your DIYs are always the best. They always hit the right tone whether it be for decorating or for jewelry accents. You always strike just the right tone. 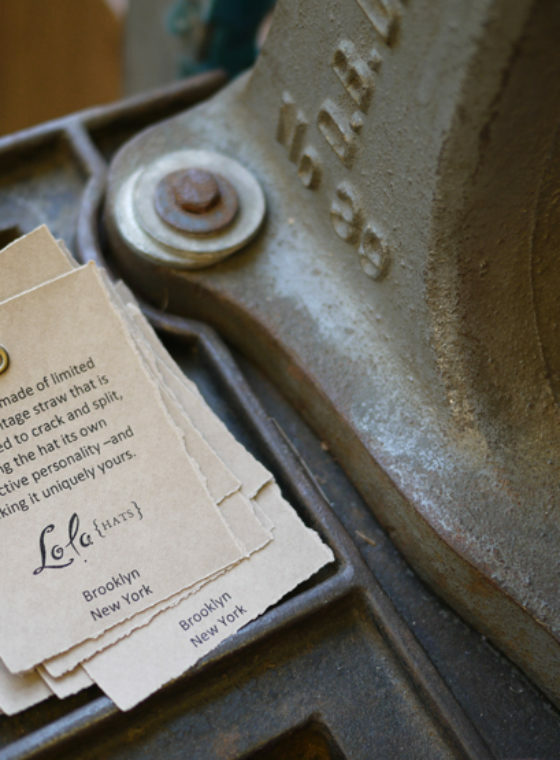 Love your site & DIYs! 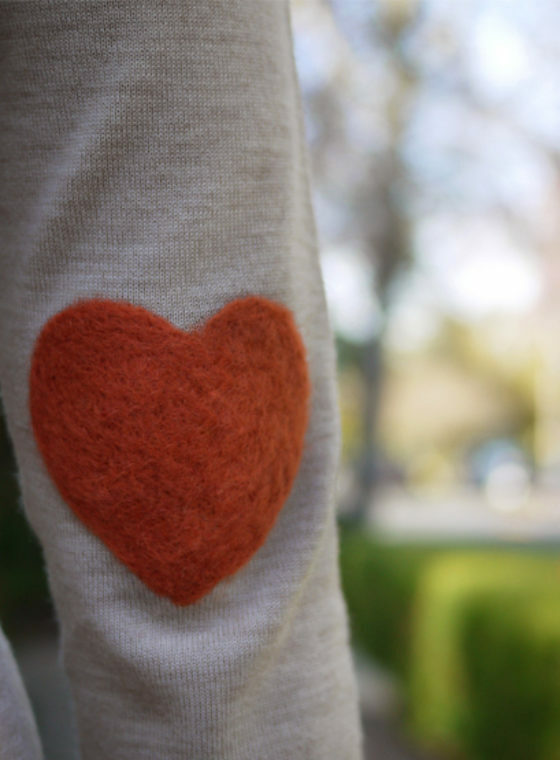 Look this blog, love it like your! 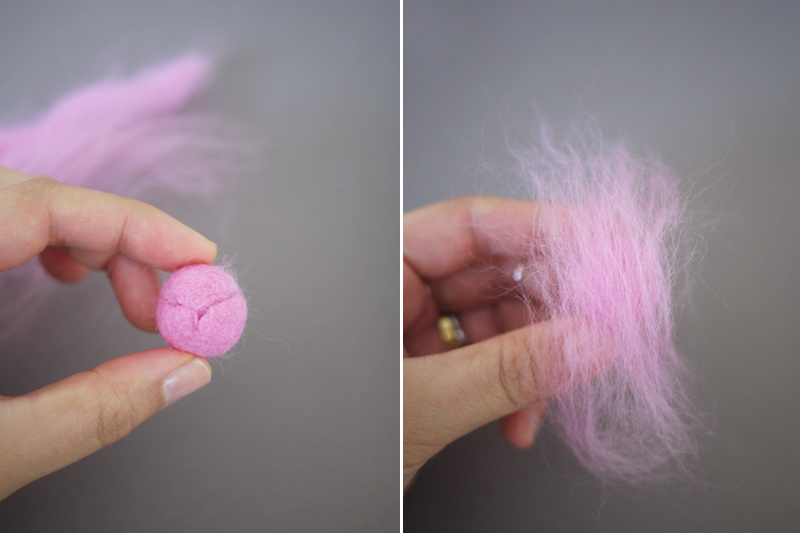 If you buy roving that is on the rougher/ more textured end of the spectrum it is also very quick and easy to do this project utilizing the needle felting method…just watch out for your fingers! Those are so cute! It could be a great family project, I think my niece and nephew would love to make them. Thanks! It’s a great idea ! BTW – would like to try it! 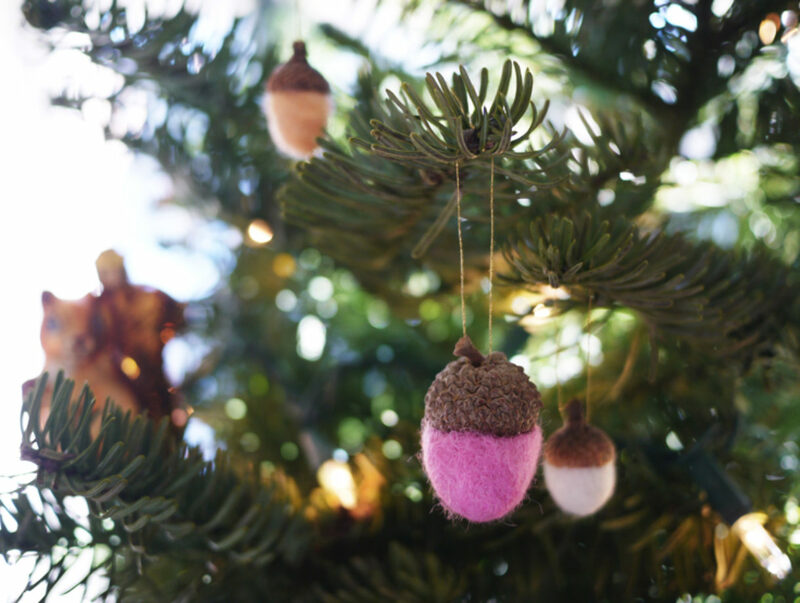 This is by far the cutest xmas DIY ever!!! Loveeee it!! These are SO CUTE! you guys have the best DIY projects! I have read so many posts regarding the blogger lovers however this piece of writing is genuineky a nice article, keep it up. So pretty! Years ago I made ‘felted’ soaps, they came out beautifully! Thanks for sharing!